Wasn’t too chatty tonight because I was in the middle of another chat, but hopefully will be back next week. 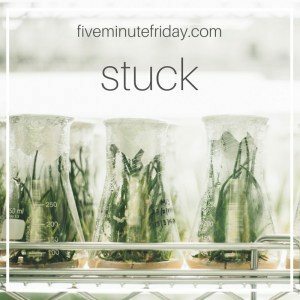 Funny story: I’ve had a blog post drafted called “stuck in the middle” for MONTHS… but I can’t remember what exactly I was going to write about. Oops! Haha. I don’t tend to write a lot about my family on the blog, but this word brought them to my mind first and foremost. Because I always, always feel stuck in the middle of my warring family. My parents divorced when I was little. I don’t remember what life was like before; part of me is glad for this, but part of me wishes I remembered something because I constantly hear two very different stories about their life together, and their lives apart. It’s unnerving, really. I never know who’s telling me the truth. I was stuck as a kid going back and forth between houses: dad’s, mom’s, and grandparents, where I took up residence. I never knew which one was really home. I was stuck in a family where I didn’t know how to fit in on either side. I was a brainy child who loved books and daydreaming and making up stories with her barbies instead of dressing them up. I was introverted, shy, and sensitive, slightly fearful and already showing early signs of depression starting in early elementary school (oh how I wish I’d had the resources as a kid I do now! ).On my dad’s side it was loud, sports fanatics who enjoyed the outdoors that I was vastly allergic to (pollen, man). On my mom’s side, it was loud, constantly moving, changing, doing new things, taking risks, zero stability and constant uncertainty–which scared me to no end (still does). I was stuck feeling like I didn’t belong. I was stuck with a stepmom who disliked kids, enough to not let me live with them once they married. I didn’t know this tidbit until I was an adult, and for that, I’m glad– even as an adult it has scarred me knowing how unwanted I was. I’m fortunate now that I have a stepmom figure who loves me like her own kid, but those feelings of unwantedness linger even still. I was (shoot I still AM somedays) stuck in a game of he said she said, where my parents and their families would fight and argue about things they did or said, usually using me, the kid, as the messenger between the two. One parent said this happened, the other said that. One says this one’s lying, the other one says this. My mom talks about how she still loves my dad and thought they’d always be together; my dad tells me the only thing he loves about her is me, the rest he hates. I always longed for them to be civil– just civil. The tension of my college graduation with my dad, grandmother, and mom in the same place left me with a constant lump in my throat the whole day. They’ve been divorced nearly 2 decades now, and i’m still scared to have them in the same room. Because I’m scared to date, to get married or have a family. I’m scared to trust people. I’m scared to open up to someone for fear of someone running away. I’m scared I’m going to love someone so much and they won’t love me back. All feelings about love and romance and having a family have been suppressed by fear- this fear that I’ll end up like my family, or that I won’t know how to love a family/husband well, or that I can’t be loved since my family never knew how to love me well. As an adult, I’m just now realizing how much of that is because of how much my childhood has influenced who I am and the trauma I’ve felt. I’m scared being stuck in my family has made it impossible for me to find love myself. divorce hurts in ways people don’t readily count upon. It’s a blight on our society. Oh, Jordan, I so feel for you. When I was a kid my ‘parents’ used me as an intermediary in their violent arguments, carrying messages between them…and I was eight years old. Prayers for you, dear one. You are loved. Thanks for your vulnerability friend. I’m thankful my parents didn’t divorce until I was older. But I so hear you about the challenges of feeling stuck between the two. It hurts my heart that your stepmom didn’t want you. So painful! Love you! Thank you for sharing, Jordan. So sorry these effects of brokenness in your family have seeped in so deeply. I hope writing about this has been helpful and that you know we are all here cheering you on. Thank you for trusting us with this. You are not alone. You are loved. You are not your parents. You are the beautiful you God knitted together in the quiet of your mother’s womb. When He was done He rejoiced in the life He created knowing that you would be a sensitive minister of His grace and mercy to the brokenhearted. He delights in you. May you find your delight in Him. Oh Jordan, I can totally relate! My dad left our family when I was eleven and married a woman who emotionally abused us from day one. I am very blessed though that my mom is very loving and stable and made me the woman I am today. That being said, it is still very hard for me to trust some 48 years later. My husband has had to be very patient at times. I encourage you to open yourself to the idea of praying for God to send you the right person to love you and for you to love. I don’t think you’ll be sorry. Jordan, I wish I could send you a hug through the computer for your honest and hurting heart. Divorce is hard on kids. Warring parents are hard on kids. I’ve tasted this bitterness in my growing up years too. The warring was worse than the divorce since I moved out before papers were served. It was hard enough as it was. Scars remain but grace has gradually healed most of the pain. I’m so glad God never abandons or abuses us. So glad. The Lord can open doors we’re too scared to open. He leads with gentleness and love. His rescues made me love Him all the more. Previous Post when depression tags along.